The Official Southern Ladies Guide to Hosting the Perfect Wedding." I came across this book over the weekend and haven't been able to put it down. Although I was raised in Pennsylvania I truly believe I am a southerner at heart. My family is from NC and I have spent most of my life down there. Through the years I have heard a lot about etiquette and the proper Southern way from my grandmothers and my mom. So to read this book it has made me giggle but there are some very good suggestions and reminders. I thought I would recite them to you over the next few days, for your reading pleasure. "One of the most important rules: do not dress your ring bearer up like a miniature man. There is nothing cute about a 4 year old boy in a tiny suit or tux. The proper ring bearer wears an Eton Suit." I know that main stream tux shops push the rental of a mini tux for your ring bearer but trust me they never look cute and always look uncomfortable. Think of something different - how about a cute white or ivory shorts and rounded collar shirt set with little buttons. Remember you don't always have to do what the tux shop tries to sell you. 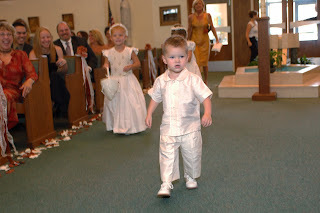 ps- the picture is of my cousin Jake walking down the aisle at my wedding. Martha Stewart & Preston Bailey are Bloggers!